How common are electronic signature solutions in business today? According to a recent study published by Celent, at least 74 percent of companies in the life insurance industry admitted to have made use of some form of esignature at work. This is a monumental increase in popularity over the past five years. A similar study published by Celent back in 2007 pegged the usage at 47 percent. So what has changed? Quite unsurprisingly, one of the most important reasons for the popularity of esignatures is the growing awareness of the technology. Silanis, one of the leading esignature providers in North America, that has the US Army among its list of clients recently reported 600 million signature transactions in the last year. Besides awareness, a major reason for businesses to migrate to the electronic signature platform is the speed and ease of signing contracts. With more and more companies now considering a move to the esignature platform, it’s important to take a look at the challenges that one might face while migrating contract signing tasks online. Here’s a brief look at some of the things you have to consider before picking an esignature service provider for your company. Businesses that decide to migrate to an esignature platform do so primarily for cost reasons. Having said that, the primary users of the platform are going to be the customers signing the contracts. Therefore it’s extremely important that the migration enhances the customer experience instead of ruining it. Does the application work across all major operating systems and platforms? Is it touch friendly to be accessible from an iPad? Does it have any geographical access restrictions? Does it allow the service subscriber the ability to provide realtime instructions to the customer? Can the service be integrated with all major CRM and document applications? Can the customer complete the signing process without having to download any new software or application? If the answer to most of these questions is “no” then the signature provider you have picked may not be the right one for the job. Every business is unique. Consequently, the processes followed by each business is different. Although a signature on the contract forms a critical part of any legal relationship between the client and the customer, it’s not really a time consuming process. Therefore, the electronic signature provider must ensure that the technology is sufficiently customizable to be able to fit the processes of any business. Businesses that subscribe to providers that do not offer this customization are often forced to re-engineer their own business processes to fit the platform. This is certainly not a good thing for any company. 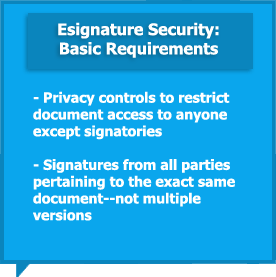 There are two things every esignature provider must ensure. Firstly, the platform must be enabled with sufficient privacy controls to ensure that only the authorized signatory has access to the documents being shared. 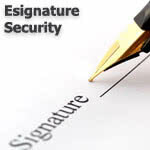 Secondly, documents must contain digital signatures that validate the actual document being signed by the customer. Digital signatures are different from electronic signatures in that they are unique reference points that track all the changes to the content of the document. This ensures that the document is not tampered with after both parties have signed. If the digital signature on the document that was shown to the customer is different from the one on the document that was signed on, it indicates a breach and the agreement is considered invalid. Besides security, the leading esignature platforms also come equipped with robust monitoring capabilities which allow the sales teams to constantly track and monitor the status of various documents. This ensures that any bottlenecks in the system, including potential tech issues, are tracked down and immediately sorted out. 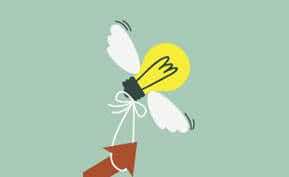 Esignature services bring about a great deal of positive change in the business workscape. Because of the quick processing of documents, businesses have reported seeing as much as a doubling of revenues over a six month period. However, picking the right provider is extremely critical and is a decision that can make or break your business. And it’s here that businesses must deliberate on before finalizing a service provider. Looking for more information on contract management software? Check out our side-by-side comparison of leading platforms in the Top 10 Contract Management Software report. You can also browse exclusive Business-Software.com resources on CLM and e-signature solutions on our contract mangaement research page.